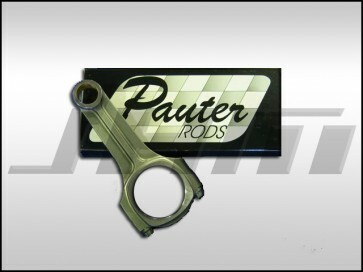 Pauter forged connecting rods for the 4.2T Audi RS6. These high quality rods are made with 4340 Chrome-Moly forged steel. Set of 8 rods with bolts. NOTE: Like any other major engine part change (rods-pistons-crank) JHM recommends having your complete rotating assembly (rods-pistons-crank) balanced for best longevity of the motor. However some people have reported that they only did a rod swap and did not have an issue. Can these rods work in the b6-b7 s4?